It was a chilly morning. The walk in was grueling, but since I decided to hunt with Kyle in his area, it wasn’t that bad. I didn’t have to be a leader. Instead, I enjoyed following until we got to the place where we split apart. Shortly after I sat down, the snow came down so hard that it was blinding. I could barely see 40 yards through the woods. Irritated that I didn’t bring any rain gear, I sat there and took everything it had to offer. 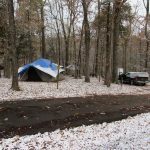 After getting drenched, I swore a little bit under my breath but accepted it for what it was – unpredictable weather in the Adirondack Mountains. Although the sun never peeked through the clouds, I could see an occasional blotch of blue sky here and there. As the morning moved toward the afternoon, I couldn’t believe how many deer I had seen. 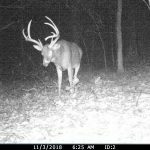 When I finally stood up to move around 11, I had seen 14 deer and passed up four different bucks, including two spikes, a 4-pointer and a really nice 6-pointer that Kyle had captured on his trail camera in the area. I had a hard time holding out, but having had a great year already, I decided to take my chances and let him walk past me. About an hour after getting up, I heard my Cousin Kyle’s gun roar. After a few minutes, I determined that Kyle had a good one on the ground. The buck had six points on one beam and four on the other. It was a beauty. Amazingly, it didn’t appear to be a very old deer. Examining the deer, I laughed a little when we spotted the bullet hole in the deer’s neck. Kyle has never been the best of shots, but at least he got it done. It has been a long time since he has killed a good one, the last one being when we used to hunt the area where we had the tent. He has done his share of missing the last few years. He always finds a way to see a lot of bucks but putting them on the ground has been difficult. He actually missed a larger buck around 8:30 before getting this one. 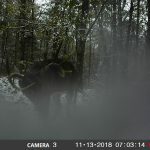 How may people see two good bucks in the same morning in the Adirondacks? Well, I guess Kyle does. I need to keep hunting with him. He seems to attract deer like people attract mosquitos in the Adirondacks, and I like it. It was cool to have my Uncle Lee and Kyle right next to each other when Kyle got the deer. The bond that is formed between a father and son when taking a deer is hard to explain to many people. It creates memories that last a lifetime. I’m glad I was there to experience it. When they took the deer out of the woods, I stayed in until dark. I saw one small doe about an hour before dark. Waiting at the dinner table for Brian, we began to get worried when he hadn’t shown up an hour after it got dark. 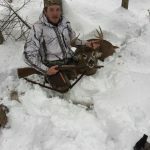 He also decided to go to an area about a half hour away where he used to hunt in an attempt to get away from the deep snow. When he finally rolled in and opened the door, he looked exhausted. He told us that he had put on many miles during the day. On his way out, he jumped a buck that was bedded next to a doe. When the buck started running, Brian took a few shots then sprinted to an area where he thought the deer would run to. He was spot on. About a minute after arriving in the spot, the buck ran through the open hardwoods below Brian. Brian emptied his clip before taking it out and emptying another one. He could tell that he hit the deer and the deer was wounded. When the deer stopped running and started walking, Brian ran out of bullets. He decided to come out of the woods and let the deer bed down. With the freshly fallen snow, he should be able to pick it up in the morning. After listening to him tell the story, I think we will probably find the deer in the morning. It sounds like the buck is on its last leg. I’d imagine it will be bedded a short distance from where he left the track. Dad saw piles of deer today. He has had a good year seeing deer when he has been able to hunt. I’m glad he’s feeling a little better today and was able to get out and enjoy some time in the woods. It has to feel good for him since he missed the best time during our trip to the Midwest. He hunted in a place that he spent a lot of time when he was much younger. I think he enjoyed his day in the woods. I headed north today to hunt with my Cousin Kyle. I wanted to be in the woods before daylight, but the weather report didn’t agree with my wishes. We got pounded by the Nor’easter, and it dropped anywhere from a foot to 18 inches in my region. Since the roads were a mess, I decided to wait until the road crews had a grip on things before heading up the road. I figured the deer would be hunkered down until the storm passed. When Kyle and I got into the woods, it was shortly after noon. We both wandered around in Kyle’s area to see what we could find. We found a lot of tracks, and it appeared that some bucks had been chasing does. On my way out of the woods, I swore that I might head home and call it a weekend. It was merely impossible to navigate through the woods without wearing yourself out. Knee-height seemed to be the average depth of the snow, and many places I found the snow up to my waist. It wasn’t fun at all, and I expended all sorts of energy just to get out of the woods. Unfortunately, I didn’t have snowshoes with me today. I think I will be moving to a couple of other areas I’ve hunted in the past to get away from the snow. It appears that the snow just piled up in this particular area as compared to many other places I’ve seen. We killed one of our biggest der ever on this date. It’s a great memory to look back on and brings me great joy. With a Nor’easter predicted to start today and run into Friday, I decided to go out for an afternoon sit in one of my old stomping grounds that always gets good this time of year. I covered a lot of ground before finding a set of tracks. Even after finding that set, I wasn’t impressed with the rest of my journey. 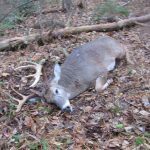 There’s minimal feed in the area this year, and a lot of bucks were killed there last year. These two things have definitely put a damper on the deer population for this year. Without food on the ground, there’s not much to keep the deer around. By the time I got out of the woods, I was highly disappointed. I’ll probably return there for late muzzleloader season, but I definitely won’t be chomping at the bit to get into the woods to see what’s going on, because not much at all is going on right now. I can’t see that changing too terribly much in the next few weeks. Traditionally, this date has been one of my best days in the Adirondacks. Unfortunately, I wasn’t in the Adirondacks today. Instead, Brian and I were in the woods pulling the last few stands we had set up. We also pulled the last few cameras we had left in the woods to gain valuable information for the future. Amazingly, we woke up to an inch or two of snow on the ground. 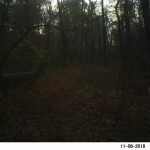 As we walked through the woods, we found many places where scrapes had been opened since daylight, and we even got a picture of a really good 10-pointer on a camera next to one of my stands. If someone had been sitting in the stand, he would have had a great opportunity to kill a really good buck. We got done with everything, including taking down the tent and packing the trailer by 3:00 p.m. and were on the road by 4:00. We drove straight through and arrived home around 10:00 a.m. on Wednesday, November 14. This morning I went with Brian to the area where I saw the buck last night. I was hoping to get him a shot at the big boy. Sitting together, it seemed like it should have been a good morning. It was calm and overcast. We heard a turkey gobble three times on the next ridge over. Since I only had a camera this morning, we just enjoyed the music and listened to the bird play its music. It’s funny the way it works when you’re in the woods. Now that I’m trying to kill a turkey, a person told us that I can still hunt for a doe. We were under the assumption that we could only shoot one buck with our tag and the antlerless tag that we had wasn’t to be used under any circumstances. I guess we just read the syllabus incorrectly. Although I’d love to kill a turkey, I would love to have some more venison. I haven’t seen many deer, so I’m sure it would be a challenge to kill a good doe. We sat until 11 o’clock and decided that we should start pulling stands to get ready to leave near the end of the week. Brian decided he could use a climber after we got the hang-on stands out of the woods. It would help us be more prepared to leave when the time comes to get on the road. After discussing our plans for the afternoon, I told Brian that I thought he should go back and sit in the stand where I killed my deer. I told him I had a gut feeling that the big 10-pointer we had on camera would walk through there today. I’m pretty sure he thought I was off my rocker when I told him I just had that feeling in my gut. I think some people get that and some don’t. We made quick work getting over to that area and were in the woods by 1:00 after getting the stands out of the area we were in. We decided that I would walk around and collect all of the cameras in this area, and Brian would sit in my stand and pull it when he came out at dark. When I pulled the first camera, I was impressed with the results. When we hung the camera a few days earlier, I told Brian I thought it was a great area for bucks to cruise during the rut. He couldn’t see it, but it kind of stuck out to me. The second camera didn’t have much on it, and the third one had decided to stop working sometime earlier in the week. Right after pulling the third camera, I heard Brian’s voice crackle across the radio. He told me he had shot at the big 10-pointer we had on camera and was pretty sure he had heard it crash after it took off running. When he came back on the radio, he said he got the buck and would need help. I went and met him, and we packed the stand out and went back to the truck to get the deer cart. As we were walking in and out, Brian told me the story of how everything played out. Right as he was getting to the stand, two does that were bedded in front of the tree stand jumped up and ran away. He quickly climbed onto the stand and got ready. Ten minutes after getting settled, he saw a 4-pointer cruising through the area where the does had been bedded. The 4-pointer came right by the stand, no more than 15 yards from the base of the tree. As soon as the buck passed, he looked toward the area it had come from and saw the 10-pointer following its tracks. He stood up in the tree and waited. When it got within 30 yards, he didn’t know if it was going to turn right or left, but it didn’t matter which way it was going to go because he would have a broadside shot. The buck chose to go down the trail to its right, which put it on the left side of the stand. When it went behind the big oak in front of the stand, Brian drew the bow, settled the pin and released the arrow. The lighted nock appeared to zip through the deer a tad higher than where it should have been, but after the deer bounded through some thick stuff, a noise jumped out of the woods that sounded like a deer piling up. Sure enough, that’s what the noise happened to be. The big 10-pointer’s legs went out from underneath it as he was bolting away. He never knew what hit him. Although he was running from the sound of the bow going off, he was mortally wounded. Brian and I met on a road in the woods and headed out to get the deer cart to get the deer back to the truck. We enjoyed the sleet and freezing rain as we took care of the deer and wheeled it through some rugged country and back to the truck. What a day. I’m glad I found Brian a handful of years ago. I always wondered whom I would be able to hunt with that had the same drive as me. I found that person in Brian and will be forever thankful for it. He’s a good guy. Today’s date is traditionally one of my best days of hunting in the Midwest. It’s a date that I’ve had a lot of success. I was hoping Brian would get a crack at something today. I went to a place I saw 15 turkeys the other day in hopes of getting a crack at the big gobbler I saw in the flock. Unluckily, I never saw a turkey, but I did see four bucks and two does, both does were being chased by bucks, one of the bucks was a dandy. I tried to get some video of him but didn’t succeed. It was an awesome sight to see. I might send Brian in there in the morning because they were running does in there. He saw one doe today and one buck. The buck was chasing the doe. 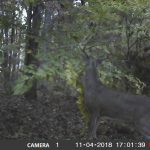 He thought it might have been the big buck he has on camera. It was cold today, 24 degrees when we headed into the woods. It felt like it got warm, but it never really did. Although the deer are moving, I’m not sure Brian is going to get the job done. He seems very indecisive with choosing a spot to sit every day. He needs to buckle down and commit to a place and go there with confidence. When we talked to one of our neighbors in the campsite, we found out that we can use the antlerless tag that came on our license. We were told a few different things. This is a good thing. I’d love to get a crack at a good doe for some extra venison. I headed back to the stand where I saw all of the does last night. There’s no way I couldn’t return there with that many does hanging out and feeding. As it was getting light, I had a doe go under the stand. A short time later another spike horn, one I didn’t see yesterday, passed under me. Then, at 7:30 I could see a good buck coming across the open hardwoods out of a little swampy area. I decided to shoot him when I saw him coming. When he got behind my tree, I drew the bow and followed him. He stopped 20 yards from my stand, and I released the arrow. Watching the red, lighted nock disappear behind the front shoulder, I knew that he wouldn’t be running very far. A few seconds later, I saw him fall over about 60 yards from the stand. The 100-grain Montec worked well. As I sat there enjoying the moment and collecting my inner thoughts, a nice 6-pointer walked past me and headed toward the deer. When it got close to the fallen buck, it blew a few times and bounded away. I’m not sure if the dead buck spooked the living one. I spent much of the morning taking care of the deer and getting it back to camp. Brian saw two bucks this morning in one place, and he saw three bucks tonight while trying to locate Dad’s stand so we can get it out of the woods. We brought the deer to the butcher’s tonight and met some nice people while we were there. I bought a turkey tag tonight in hopes of slaying one of the pesky birds that has been all around me all week. I’d love to put an arrow through one and eat it for Thanksgiving. I also want to be in the woods to see deer doing their thing. You can learn a lot from deer, and that’s what I hope to do until we leave. You can never be too educated about anything, especially deer hunting. Every day in the woods is a chance to witness something you’ve never seen. It was 24 degrees this morning, and the wind chill made it 13 degrees. It was a little chilly. I miss Dad. I wish he was here today. I got pretty choked up in the tree this morning as I tried doing a recording for Alex’s film project. I was disappointed to find that the battery had died. I think the footage would have been perfect for his film, something he would have treasured. It was also something that you can’t rehearse or try to replicate. This morning was a bit chilly but comfortable. I had a lot of activity around me in all shapes and sizes. After this morning, Brian and I named the place I sat, and it is now called Spikehorn Ridge. Before the morning ended, I saw four spikes and a small 4-pointer. I also saw 17 does and fawns tonight and about three different bucks chasing them around. A 6-pointer seemed to be the one that was ruling the party. It was pretty cool to see. Although it has been slow, today made me realize that there are plenty of deer around even if the sign doesn’t say the same. Brian went back to check a camera that he moved a few days ago. He had to sit down for a minute when he pulled the card. After having the camera in one place for most of the time here, he told me he was a sure that a big buck was using a runway, which is what made him move the camera. He was definitely right about that. He got a slammer on trail camera and is probably going to throw all of his eggs in one basket and focus on that deer the rest of the time. I can’t say that I blame him after seeing the picture. This deer is a great public land deer. I hope he gets a look at the deer. Jeff and Doug saw a few deer today, each seeing a couple of bucks. They hunted in another new area today and said it looked good. When we got back from the evening hunt, Doug, Jeff and Dad headed home. Dad just didn’t feel well enough to stay for the remainder of the trip. I hope he gets feeling better. It was chilly when I woke up this morning. Although it wasn’t extremely cold, the wind made it brisk. I headed back to the area I found last night and felt confident about it. I was in the stand for about a half hour before daylight. I could hear deer over the hill from where I was sitting as I waited for it to get light. When it got light out, I could hear something behind the stand. Turning my head, I saw a small buck in the distance. After putting the glasses on it, I determined that it was a forky. He looked like a healthy deer. After he got past me, something spooked him and he rain back toward me before disappearing in the direction where Brian was sitting. A few minutes after that, I heard a stick crack, and a buck appeared directly below me. He was a shooter, and I started drawing my bow. Halfway into the draw, my draw elbow came to a sudden stop when it got tangled in my harness. The buck stood there and looked down the hill. After getting untangled, I drew the bow again, but the deer was moving. I chose not to risk a shot and watched him disappear. I was highly disappointed. A few minutes after the buck left, a doe spooked from behind the tree stand, and that was the end of deer sightings for me for the morning. I got out of the stand at 11:00 and walked around a little bit when I hit the ground. I found some good buck sign, but I think I’m in the best place in the area. Brian didn’t see anything this morning, and Dad didn’t hunt. He’s in rough shape. I think he’s going to be heading home tomorrow with Doug and Jeff. They didn’t see any deer today. Dad can’t buy a break. I’m really disappointed that he won’t be able to hunt. We wait all year for this and now he’s not able to do what he enjoys. I just hope he gets feeling better. He doesn’t look good at all. This evening Brian and I went to check a camera he put in last week. It had a good buck on it a few times in the daylight. I liked the area and will hunt there if I ever come back to hunt. I was impressed with it. On our way in, we saw a 10-pointer chasing a doe. It wasn’t a mature buck, but it was still a shooter. The wind was nasty tonight. Tomorrow morning should be the best day of the trip as far as the weather is concerned. I’m hoping that we see some activity. It hasn’t been too good yet this week, but you never know what could happen in a day. We met a lot of nice people today and got some good intel. It’s nice to meet people who are good people. We’ve met a handful of others that I wasn’t fond of and wouldn’t care if I ever saw them again. Looking forward to tomorrow. I’m hoping someone has some luck and puts a good one on the ground. Today wasn’t as cool as it was supposed to be. I was a little disappointed, but I can’t control the weather. It got up to 65 degrees today but seemed warmer. I got right back on the horse, only having three hours of sleep. I returned to the area I hunted last night. I felt confident going to the stand, but I never saw an animal. Brian hunted with me and saw a 4-pointer. Tonight we went to try out another new area, the same one we scouted in the pouring rain a few days ago. There were seven guys there, so we left and hung a stand in another place we found. I feel really good about it. I found a lot of sign, and it looks really good. I’m looking forward to spending some time in a tree in that area. Dad got back into the woods tonight. He saw a few deer right before it got dark. He feels better today. Hopefully, he can keep the pain from coming back. Tomorrow should be the best morning yet. It’s supposed to be 30 degrees. I feel good about tomorrow for all of us. You are currently browsing the Hunting Journal blog archives.